Brian doesn’t have to do a lot of walking during his work commute each week. That’s because MetroLink does the heavy-lifting. His trip starts by driving about a mile to the Shrewsbury-Lansdowne I-44 MetroLink Station. He parks his car in the free Park-Ride lot and boards an eastbound Blue Line MetroLink train toward downtown St. Louis. His train ride ends at the Stadium MetroLink Station, where it’s a quick walk to his job at Asynchrony Labs. Asynchrony Labs offers its employees a choice of work commute benefit: parking pass or transit pass. Brian choose the latter, and he wasn’t the only one. “There are 30 to 40 employees that take Metro to work,” he said. 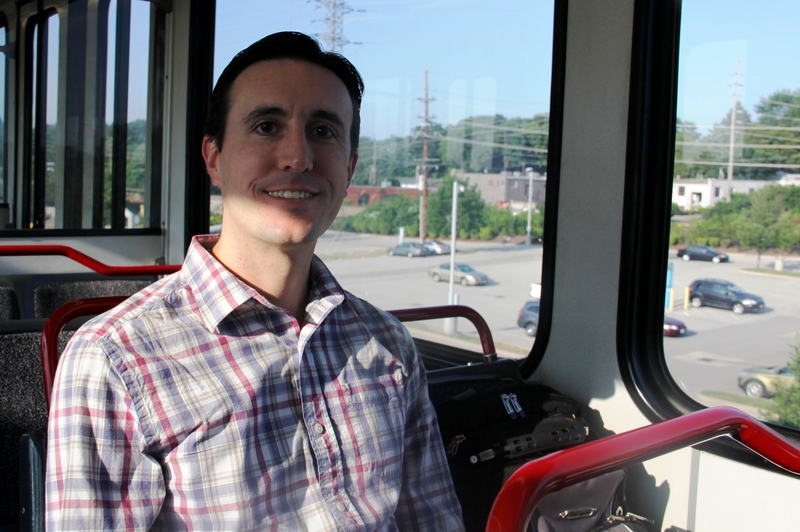 Brian started riding MetroLink in January for environmental reasons. He wanted to reduce his carbon footprint. “I wanted to cut down on driving to work each day,” he said. But as he rode MetroLink more, more benefits started to surface. I really like Brian’s switch to public transit. If he lives in South County, Pretty soon, he will have a stop even closer to him. And he is right about being granted the right to space out to electronics. You can get yourself into trouble if you space out to your car stereo or cell phone while driving. What is Patrick talking about a closer stop to south county soon?